HUANUO Dual Gas Spring Monitor Desk Mount Provides an Ergonomic Solution for a more Comfortable & Productive Work Environment! This gas spring dual monitor arm comes with two gas spring arms that you can easily adjust the to get a better posture, relieving the strain on your neck, back and shoulders. Your brand new gas spring dual monitor stand fits two 13" to 27" monitors with VESA Mounting patterns of 75mm x 75mm or 100mm x 100mm. Securely holds 2 monitors each weighing between 4.4 to 14.3 lbs. - The plate can be rotated 360°, swiveled 180° and tilted from -45° to +90°. This stand easily holds two monitors on both arms instead of keeping the monitors on the desktop, saving you space and keeping your desk neat and tidy. The arms are adjusted by our secure gas spring mechanism. To adjust the tension for your monitor. Turn clockwise to reduce gas spring tension for lighter monitors and turn counter-clockwise to increase tension for heavier monitors. Comes with hidden cable clips, the arms can keep your cables neat and organized. You will never need worry about your messy and tangly wires. 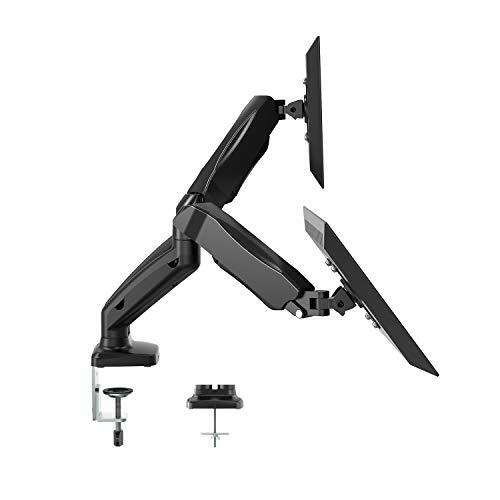 DUAL MONITOR DESK MOUNT WITH 2 MOUNTING OPTIONS - Both arms are directly mounted onto the desk which creates greater stability. Adjusting one arm will not move or affect the other arm. Except the clamp, this stand can also be fixed via grommet mounting hole. The clamp fits desks with a thickness up to 3.26". The grommet mounting fits desks with thickness up to 3.4"